Scare Up Some Cookies We had a cookie decorating play-date and the boys had a blast. Spooky Storytimes Many local libraries and bookstores have Halloween themed storytimes! I included some favorite Halloween books so you can make your own storytime too! Halloween BINGO This is great if you are stuck at home handing out the candy. Pumpkin Picking (Pumpkin Patch) Every year we go with friends to the pumpkin patch and let the kids pick out a pumpkin. We usually end up at the farm's store eating apple fritters or donuts and drinking apple cider. It's a great time and I look forward to it each year. Haunted Gingerbread House We decorate a gingerbread house at Christmas as a family and last year we started decorating a Haunted Gingerbread House for Halloween. It's lots of fun! Halloween Scavenger Hunt Card Now that we walk to the bus stop, I am really looking forward to using these again. My Brownies Have Turned Into Ghosts! Pumpkin Seeds I love roasting pumpkin seeds. My kids love them and I don't feel bad giving them this snack. 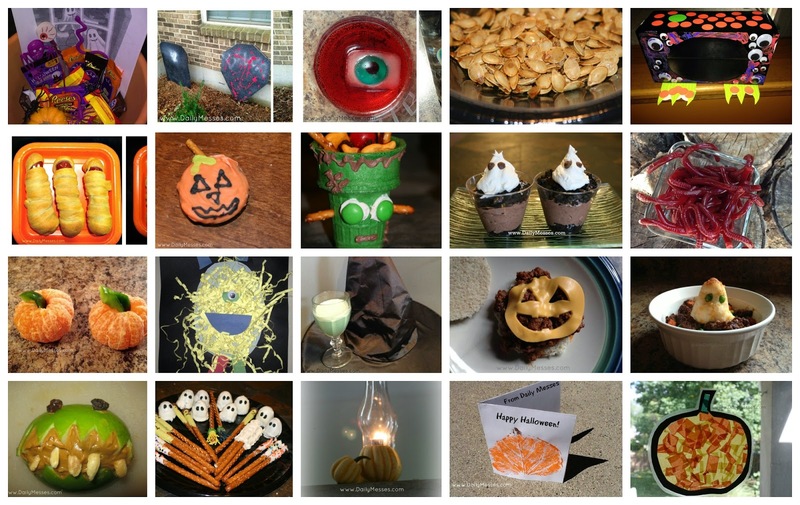 Frankenstein Cups Create super cute Frankenstein snack holders out of pretzels, candy, icing, and green ice cream cones. Rice Cereal Ghosts, Frankenstein, and Mummies! Love Halloween? Love rice cereal treats? Then these are the snack for you! Monster Apples These are a great snack! I LOVE October Making caramel apples. Pumpkin Dip This is great at Thanksgiving, but it works well with the pumpkin time of Halloween too! Have Your Cider and Eat The Cup Too! Use an apple to create an instant cup for apple cider. Mommy's Little Helper: Warp Corp Breach WARNING: This is an alcoholic drink. BONUS: It looks super spooky with dry ice and might help you get through sitting and handing out candy. Mummified Hot Dogs Have hot dogs and dough...will make mummies. What's For Dinner Mummy? Mummy shaped meatloaf (including my meatloaf recipe). Mummy Muffin Pizzas Super easy to make mummy mini pizzas using English Muffins. The Not So Spooky Lunch Easy to make ghost cups and Halloween themed lunch. Attack of the Play-Doh Spiders! These were one of my favorite crafts last year. They are a little time consuming, but a huge hit with the kids. These are a perfect treat to bring into school if you have food restrictions, because who doesn't love Play-Doh!? Eerie Spiders and Ghosts Reuse old egg cartons and make spooky little spiders and ghosts. Pumpkin Pots If you have a clay pot, a sharpie, maybe some green pipe cleaners, you can make a quick and easy Halloween decoration! Ghostly Handprints These make a cute craft or Halloween card to send to Grandma/Grandpa. Pumpkin Cards With a little paint, some paper, and the right shaped leaf, you can create a great Halloween card. Pumpkin Boats. We made these for Pirate Day, but they work well at Halloween too! Pumpkin Alternatives If you don't want to deal with the mess of carving pumpkins, here are some alternatives. Pumpkin Coloring Page at the bottom of the post. Sweep Your Way Into Snacks: Broomstick Bags These make a great decoration or favor bag for a Halloween party! Gourd Lighting (aka Pumpkin Candle Holder). I had this as a Fall and Thanksgiving idea last year, but it also fits well with Halloween. Help! The Toilet Paper Roll Turned Into A Monster Easy to make monsters using toilet paper rolls. Trick Or Treat: Halloween Safety Some of my safety tips and ideas for trick or treating.